Sweetwater bundled forces with mixer/producer and FOH mixer for the Counting Crows Shawn Dealey to show you how he mixed the Counting Crows hit ‘Mr Jones’. Shawn Dealey and Mark Hornsby, Director of Music Production and Artist Relations at Sweetwater Studios, present a video on how Shawn mixed the Counting Crows hit ‘Mr Jones’. 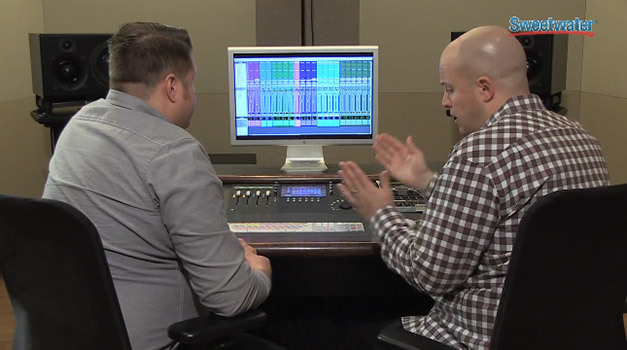 Shawn and Mark discuss how the mix was created inside vid’s Pro Tools. During the video Shawn and Mark use Pro Tools 11 and discuss lots of things like workflow inside Pro Tools, CPU usage, the use of plug-ins for compression, EQ and more. But that’s not all. Shawn is such a good sport that he is providing the tracks of the song so you can have a go at mixing it yourself. All you have to do is visit this page on Sweetwater’s website to download the tracks of the song. You are only requested to fill in your name and e-mail address and the tracks are yours. This is a good moment to grab your copy of Mix Buddy and save all the mix tips into it that Shawn and Mark are giving you. But also to find lots of mix tips while mixing the song. What’s that you say? You don’t have a copy of Mix Buddy?! Well you can get Mix Buddy here in the App Store for a small US $1.99. It contains EQ characteristics and mix tips for many instruments plus over 2 hours of tutorial videos on audio technology. Here’s the video from Shawn and Mark that is over a 100 minutes long. Enjoy! !